Procter Automotive is proud to offer reliable and friendly auto service including clutch replacement in Abilene, TX. Most vehicles will make it over 100,000 miles without requiring major clutch repair, but when the time comes the service can be complicated and costly. Do not trust this complex and essential repair to just any shop, but that does not mean you need to pay high dealership prices. We have been in business for over sixty years. We know cars and trucks inside and out, and have the ASE certification to prove it. ASE certification is awarded by National Institute for Automotive Service Excellence to auto service professionals and facilities who show mastery of auto repair and a commitment to continuing education. 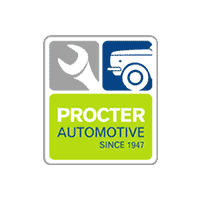 Procter Automotive is happy to show our commitment to our customers with this certification. Some indications that your vehicle may need a clutch repair include a burning smell or even smoke emitting from the vehicle, gear slippage (loss of gear or jerking), and the clutch sticking. Clutch failure can be dangerous – do not continue to drive your vehicle, and bring it in for diagnosis and service as soon as possible. Whether your clutch requires total replacement or just car maintenance or repair we can handle it at our Abilene facility promptly and for a fair price. Procter Automotive looks forward to helping you with clutch replacement or any other service, such as check engine light, brake repair, oil change, alignment and much more from our conveniently located Abilene shop. We are open for service appointments from 7:30 a.m. to 5:30 p.m., Monday through Friday at 1325 Butternut Avenue. You can make a service appointment 24/7 from the convenience of your home or mobile phone. Just click on the “schedule an appointment” button located throughout our website. Just give your contact information, describe your vehicle and the requested service, and indicate up to three days and times that work for you to drop off your vehicle. We will promptly call you back during our business hours to confirm your appointment details. Procter Automotive is happy to serve all of your auto repair and maintenance needs. Contact us today to get started on your auto service in no time flat.